"Kirsty has been working with Ardkinglas Estate for the last year and we are delighted with the publicity she has generated for us. Her enthusiasm for her job and her extensive contact base built up over many years in the tourism industry have meant that she has been able to generate a number of leads in a very short time. She has managed to deal with our different tourism income streams bringing them together in a coherent PR strategy. My job at Ardkinglas Estate as overall manager means that PR and marketing often get pushed to the bottom of the pile but Kirsty ensures that they get the attention they need. Kirsty is happy to work as many or as few hours as we require and therefore is an asset to small, or large, new or established businesses." 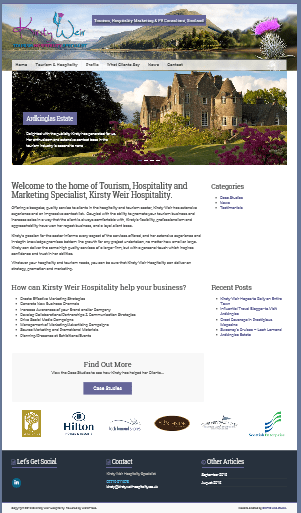 Kirsty Weir Hospitality is excited to announce the launch of a newly designed website at www.kirstyweirhospitality.co.uk, which goes live today, Wednesday 23rd September 2015. The site's homepage welcomes visitors with a clean and fresh design, easy to navigate pages and content featuring some of Kirsty's key successes in Commercial Tourism, Hospitality & Marketing. Content and articles on the new website will be updated on a regular basis, giving details of new events, case studies and key projects, as well as the latest news and developments in the tourism and hospitality sector. Kirsty's primary goal in commissioning the new website is to attract new visitors, provide potential and existing customers with key information on the kinds of services which Kirsty can offer to her clients and provide details of past and recent successful projects - allowing customers to decide whether Kirsty's skills are the right match for the job! The site was created by GraffiQ Web Studio. For further details, or to enquire about a website of your own, please direct all enquiries to GraffiQ quoting referral code KWH1. 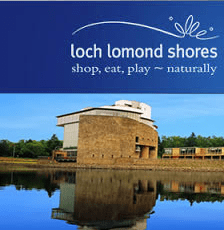 “The hugely successful launch of Loch Lomond Shores generating almost one million visitors during the first twelve months was clearly a team effort, but the all-important and immensely valuable contribution from the tourism industry sector was undoubtedly due to the professionalism and commitment of Kirsty in her role as Business Development Manager”. “While General Manager at The Lodge on Loch Lomond Hotel, I worked closely with Kirsty to develop new business mixes to service the hotel’s new developments. Kirsty’s project was to oversee the Marketing and Sales requirements for the new corporate and wedding market. Kirsty played a key role to help the business delivery 80% above the owner’s set financial goals within the first year.